Wild beasts can deliver big potential rewards in the volatile Grizzly Gold slot game from Blueprint Gaming. It’s a simple 5 reel, 1,024 ways to win title. Look out for multiplier wilds that can double or treble in the base game. In the bonus round, unlimited free spins are on offer. The multipliers can combine during those free spins to send payouts rocketing by up to 27x. Play on your PC, tablet or mobile from between 10p and £100 per spin. A snowy woodland forms the backdrop to the action in Grizzly Gold. Joining the A to 9 royal values are owls and big cats, a moose and howling wolves. The most rewarding symbol is the grizzly bear which will get you 1, 3.75, 5 or 6.25 times your stake if you land 2, 3, 4 or 5 on adjacent reels. That might not sound like a bumper reward for a top paying symbol. The 1,024 ways to win game engine offers chances to land multiple winning combinations though. Grizzly Gold also comes with multiplier wilds. When these form part of a winner, they payout is boosted by 2x or 3x. Things can get even better during the feature round. To trigger that Grizzly Gold Bonus feature, you’ll need to land 3, 4 or 5 scatters on the same spin. After a payout of 2, 10 or 20 times your total stake, you’ll be awarded 8, 15 or 20 free spins. The multiplier wilds can combine during the feature. For example, land a pair of 2x multiplier wilds in combination and the payout is quadrupled. The perfect fall is a trifecta of 3x multipliers which can combine to send the payout soaring by a massive 27x. Re-triggers are possible 2. Land 2 scatter for 5 more free spins. Land 3, 4 or 5 for the full re-trigger of 8, 15 or 20 free spins. In fact, you can retrigger unlimited times for infinite extra free spins. 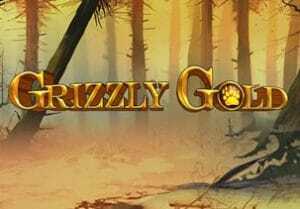 Compared to many of Blueprint Gaming’s branded slot games, Grizzly Gold is a very straightforward game. That’s not necessarily a bad thing. The simple gameplay works well enough here and the multiplier wilds offer enough action to keep things interesting. The overall variance is high with top payouts of 10,000 times your stake on every spin. This trip to the great outdoors is an enjoyable one. Get lucky with those multiplier wilds and these bears could deliver some Grizzly Gold. I also suggest you try other Blueprint Gaming titles with The Goonies my pick.